Piper has just announced their new maintenance program, making it an even BETTER time to purchase! 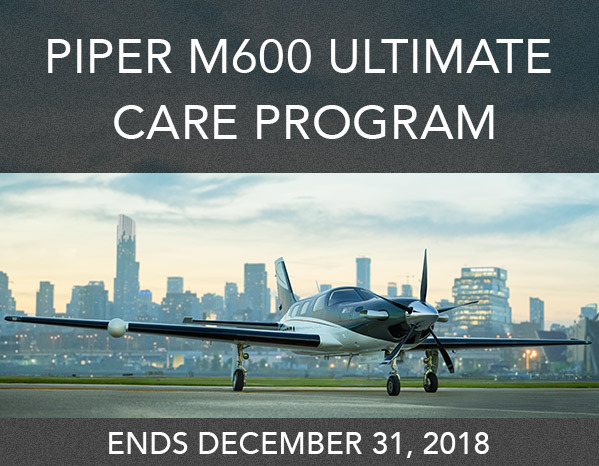 Take delivery of select new Piper M600, and receive complimentary enrollment in the Piper M600 Ultimate Care program, providing scheduled maintenance to your aircraft. • Coverage includes aircraft inspections for the first 5 years OR 1,000 hours of operation, whichever occurs first. Categories: News & Events | Tags: Aircraft, M600, m600 deal, m600 maintenance program, Piper, Piper aircraft, piper m600, Skytech, and Skytech inc. This entry was posted on Tuesday, November 20th, 2018 at 3:01 pm. Both comments and pings are currently closed.